fabulous motherhood: Next step and new beginning for Fabulous Motherhood..
Next step and new beginning for Fabulous Motherhood..
Alhamdulillah, we are officially a registered company with SSM. Syukur, the first choice of name was accepted by SSM. 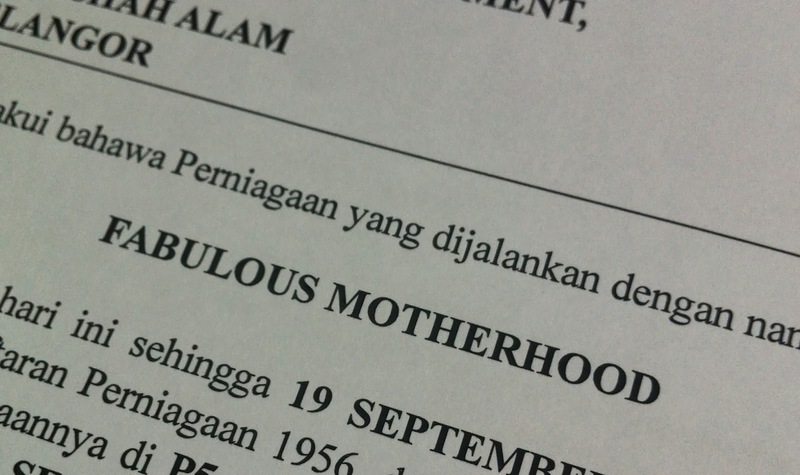 Fabulous Motherhood officially belong to us *my family*, thanks to Allah. Ramai tanya, Nadia nak buka kedai ke?? Owh no no..masih jauh sgt tu. The decision to register pun ada sebab, kebetulan yg tidak langsung pernah dirancang. We still running as usual. A reseller for Qaiser Darussalam stuffs. And welcoming new learning products from Leap Frog to our humble blog. Yeap, we have lots of plan in future. Orang kata pelan2 kayuh. I wish to have a site which can helps parents in Malaysia specially, to choose and purchase learning stuffs for their children as extended learning at home. Basically all about early learning products and for parents as well. As what I did earlier, most of the products introduced at my blog, normally I dah test and pakai for my kiddos. So mmg yg betul2 recommended gitu. Stay tuned for more and more news and update with Fabulous Motherhood.. There is no other words can expressed my feeling now.. I'm so happy and truly blessed with the opportunity given. Syukur and syukur Ya Allah..
Semoga Engkau permudahkan segala urusan hambamu ini.. Thanks for all the wishes at my ig..
congrats n keep up the good work. Thank you so much dear..I really really appreciate those ideas and welcome any feedback and intro of products from my readers as well. Sometimes I pun tak dan nak survey semua. Will take a look on products u mentioned too. Congratulation Nadia:) Proud of u.
tp skrg i xmampu nak beli2 lagi la. but will always stay tuned with all ur products etc..
doa n support mcm biasa. u, nnt tulis steps nak pegi register ni.